One of the most intimidating aspects of receiving dental implants is knowing what to expect in the hours, days, and weeks following the procedure. Although it might seem scary to walk into our office and leave with a brand new smile, most patients enjoy a simple recovery with less downtime than they think. Here is what to expect after dental implant surgery and a few tips to help you to speed recovery. Most patients report that the actual dental implant procedure feels like any other dental restoration. Dr. Newman will use powerful local anesthetics to completely numb the area where the implant will be placed. Although patients might be able to feel pressure, there should be no pain after the initial anesthetic shot, just like when you get a filling or a root canal. To stay calm and relaxed during the procedure, some patients also opt for nitrous oxide. Procedure timeframes vary significantly based on the patient, which kind of implants are used, and how much preparatory work is needed before permanent dental crowns can be placed. However, the actual placement of the dental implant usually takes under an hour, as long as there are no complications. The implant will need time to fuse with the jaw tissue. Here is what to expect following dental implant surgery and how to ensure a successful recovery. Because local anesthesia can take some time to wear off, patients shouldn’t experience any pain directly following the procedure. Patients shouldn’t drive immediately following the surgery, since anesthesia levels can vary from person to person, and you might be too woozy to drive safely. Patients are instructed to bite down on gauze packs for the first hour to encourage the formation of blood clots around the implant site, and ice can be used to reduce facial swelling and bruising. Patients should take the day of surgery off from work and other activities, focusing on rest and recovery. Exercise should be avoided for the first two or three days following the procedure, since it can increase bleeding. Pain is common as the anesthetic wears off, which is why patients should take any pain medications as prescribed by Dr. Newman. Some patients might also be asked to start taking an antibiotic to fend off infection. Soft foods can be eaten the day of dental implant surgery, but straws should be avoided when drinking as they can knock blood clots loose and disturb healing. If possible, resume your normal oral hygiene routine two or three days after surgery. Brush and floss gently, and focus on keeping the mouth as clean as possible. Be gentle around the implant site. Saltwater rinses can help to control bleeding, swelling, and discomfort. Some patients experience a small amount of facial bruising following surgery, although this is temporary. On day three, patients can start eating normally, although extremely hard or chewy foods should be avoided up to 6 weeks following implant placement. Newly placed dental implants can take 4-6 weeks to completely integrate with your natural bone tissue. 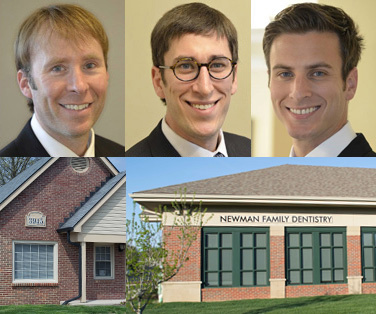 During this time, you should contact Newman Family Dentistry if you notice anything abnormal, including excessive bleeding, swelling, foul discharge, or pain. For more information about what to expect following dental implant surgery, contact our nearest office, or talk with Dr. Newman during your next consultation.